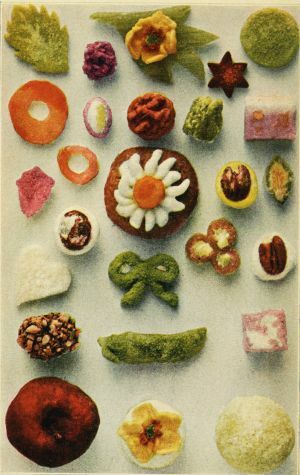 Have fun with this age old recipe for Boiled Fondant, and be sure to check out the myriad of other old similar recipes on this site for home-made confectionary. Put the water into a pan, add the sugar and allow it to dissolve slowly, then bring to the boil. Add the glucose or cream of tartar and boil to 240°F. Pour the boiled fondant syrup on to a slab and allow it to cool for a few minutes until a skin starts to form. If no marble slab is available, let the syrup cool in a bowl for about 15 minutes and then work it until it is thick. Using one or two palette knives, collect up the mixture,then continue to work it with a forward-and-back movement till stiff enough to handle. When the fondant becomes opaque and firm, scrape it up and knead well, until it is an even texture throughout. Roll out on a slab dredged with icing sugar, and cut. For pin-wheels, roll up layers of two colours, and slice.